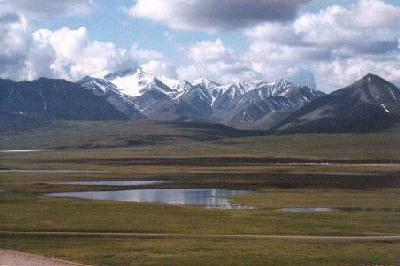 Alaska's Brooks Range is one of the more remote and rugged mountain ranges on the planet. It stretches for 700 miles (1100 km) across the northern part of that state, in a region that is almost entirely uninhabited, but is home to a collection of wildlife that includes large herds of caribou, as well as moose, bear, and other large animals. It is, by all accounts, a fantastic wilderness setting that remains largely unexplored and untamed. "My means of travel will be via foot and packraft (about 500 miles rafting). I will start off at Atigun Pass on the Dalton Highway in the center of the range, first completing an eastern loop around the Gates of the Arctic Preserve and ANWR, coming within 6 miles of the Canadian border before heading back to the road. The western loop involves heading west down to the Ambler+Kobuk River before making my way NW to Noatak, coming within 5 miles of the Bering Sea, before heading back east again towards the road. I finish off my journey by floating down the North Fork of the Koyukuk River (through the Gates of the Arctic) to Coldfoot. Overall, I'll be traveling through Gates of the Arctic National Park and Preserve, Arctic National Wildlife Refuge, Kobuk National Park, Noatak National Preserve and Cape Krusenstern National Monument." That's a pretty ambitious undertaking to say the least. Jack says that if he is successful, he believes he may be the first person to traverse the range twice in continuous fashion, although that isn't something that is of primary importance to him. Instead, he's looking for a great adventure for the summer months, particularly since the 21-year old has just graduated from college at the University of Miami in Ohio. The Brooks Range Odyssey, as Jack has dubbed his expedition, got underway yesterday. He promises that he'll share weekly updates on his blog, which you can read here. Good luck to Jack on this great trek. What an amazing place to spend his summer.